I came to Japan as an assistant language teacher, working in public elementary and junior high schools throughout Japan. Recently, I have started teaching adult students as well in corporate conversation classes. I was introduced to this job by a friend. When I first started, there was no set curriculum or lesson plan, unlike the more structured schooling setting. I was completely in charge of my lessons (which I will write about more in detail including techniques and approaches to these kinds of lessons). Time management has never been my strong suit. In fact, when teaching in a public school setting, there were numerous occasions where I would end too early or go over time without finishing the lesson. In a school setting with younger children, finishing early was probably preferred. That just meant it was time for a game! However, when teaching adults in a corporate environment, you can't exactly have them play criss-cross in the meeting room. The first time I finished early, we had a bit of strained conversation. 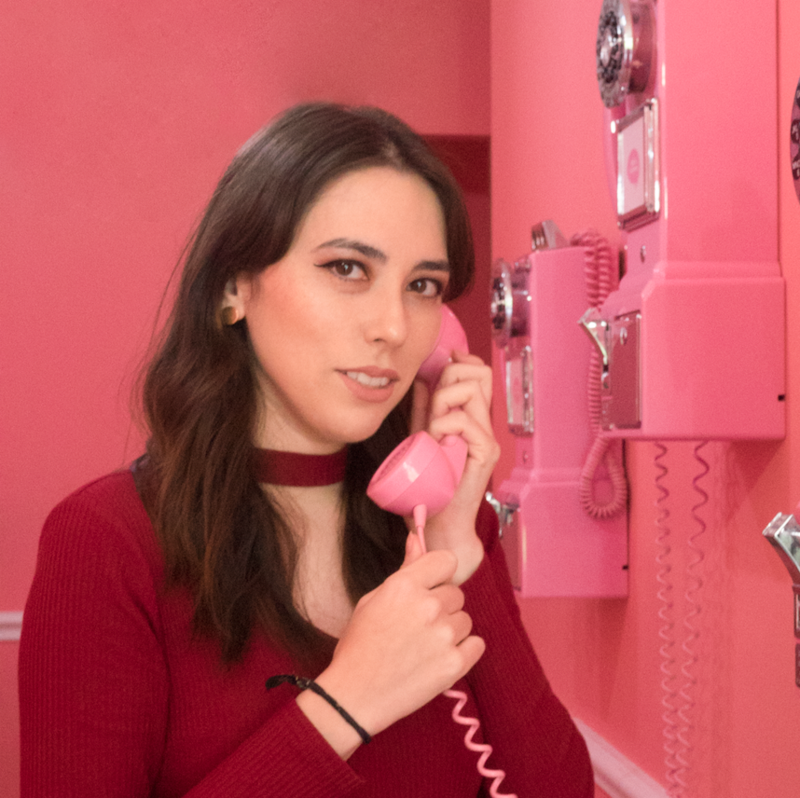 It was mostly me asking questions and them answering, without much discussion. I returned home determined to remedy this the next time. 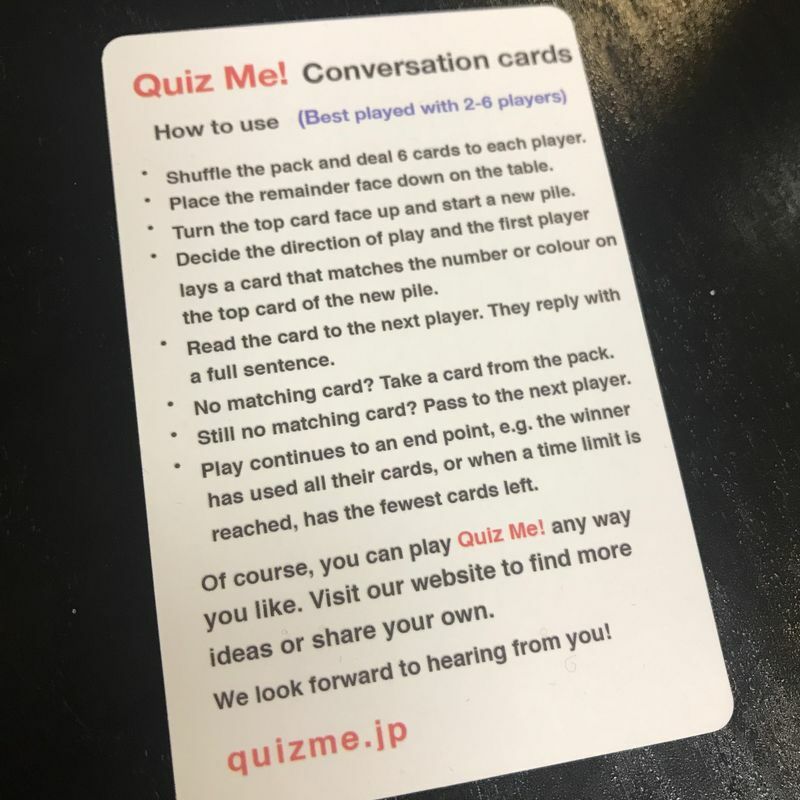 Enter these conversation cards I got from a fellow teacher. The pack is small enough to keep in my purse to bring along for every lesson, but it was full to the brim with interesting conversation starters and questions. While I have an "official set," any teacher could easily draw inspiration from them and create their own set with a word editing program. Basically, the premise is that there are multiple colored and numbered cards. (See them in the top right corner?) You want to use these colors and numbers to get rid of as many cards as you can. The person who has no cards in the end is the winner. It really spices up what can otherwise be a boring question and answer round. The "official" rules explain it a bit better than I do. But, as the card says, you don't need to play that way. This is just a guideline and you can use them however you like. Perhaps you want to play Go Fish style or something more akin to Uno. These are only guidelines, and switching things up will keep it fresh. 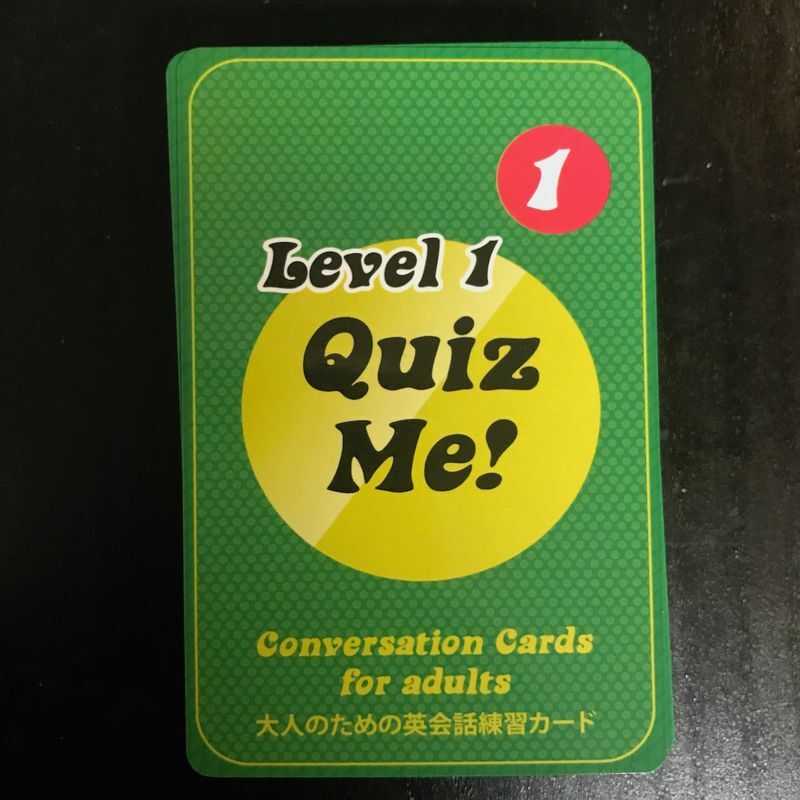 Some questions are quite difficult and require complex lines of thinking, which is why these are considered "adult" conversation cards rather than general use ones. But, these difficult questions are great at sparking conversations as well because it opens the floor to discourse and debate. 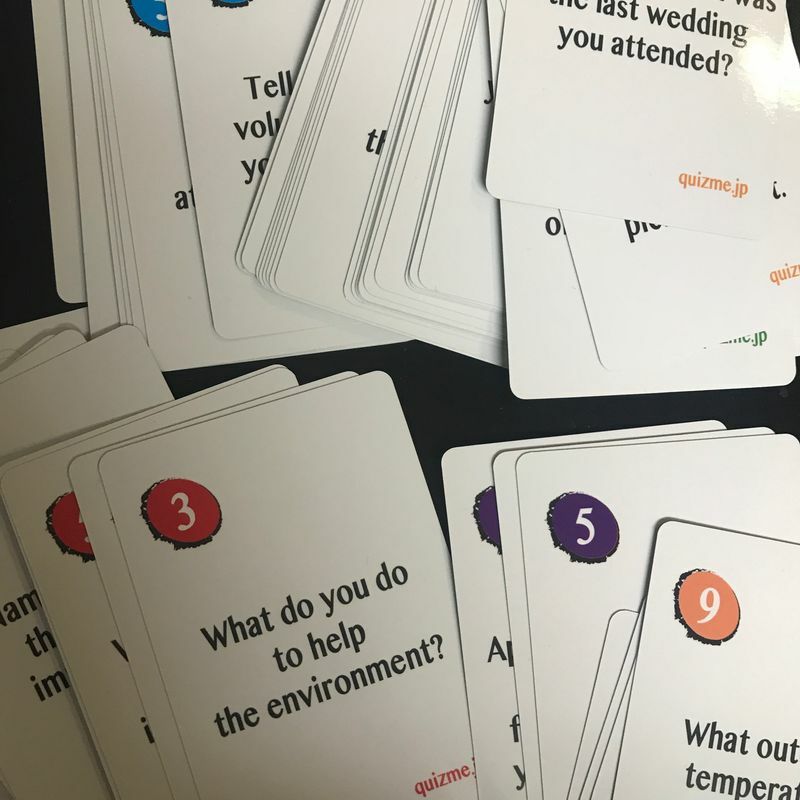 I'm really happy that I started carrying these conversation cards along. Sometimes, I'll dedicate an entire lesson to them (rather than the normal plan) because its seen as a fun break. Plus, the whole point of the class is to communicate with one another, and there are some great ice breakers in this. Now, these have become my go-to whenever I need to pull something out of thin air to cover for mismanaged time. But, I'm sure there are a lot of other tricks and tips fellow teachers have when it comes to extending a class when you end up finishing too early. Teachers of City-Cost, what are some tricks that you have up your sleeves? 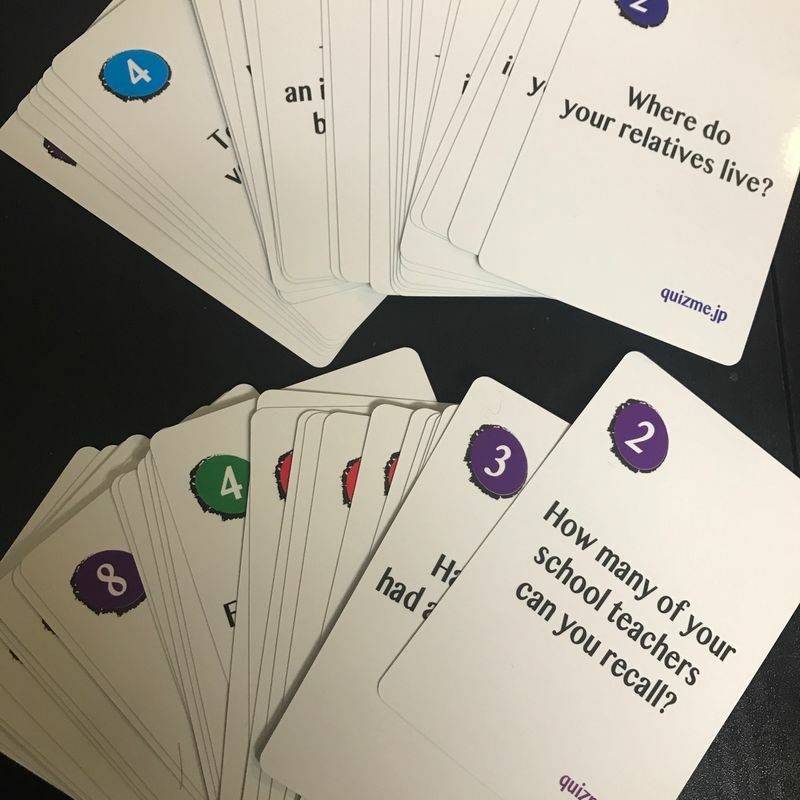 I haven't taught for a while now but I like the look of those cards. I was always a fan of having students draw out random questions or vocabulary and having them do something with that. I was also a fan of stopwatches and something that can be thrown around so that you can do a kind of pass the parcel type thing -- set a Q&A situation rolling, students with the ball ask someone else a question, pass them the ball, they answer and address another question to another student, whoever has the ball when the timer goes off looses. When I was teaching adults though, when a class was at its best it was almost like just a group of friends chatting over coffee (although without the coffee). With these kinds of class if I had time spare I'd just try and get them involved in some gossip or go over some of the latest news (if they were at that kind of level).